Mang Inasal is the restaurant that me and my beloved frequent whenever we go to the malls to watch movie. We like Mang Inasal because of its affordable unlimited rice promo. It seems that we are not the only ones attracted by Mang Inasal's unlimited rice promo because many flock the restaurant every lunch time. The usual result are very long lines of people waiting for their turn to eat at Mang Inasal. 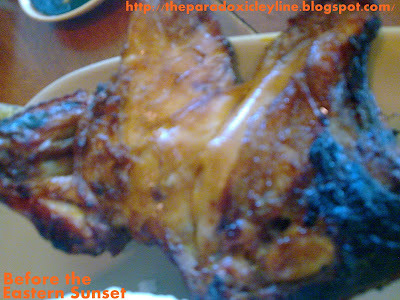 Inasal is the Ilonggo term for chicken barbecue, so this means that Mang Inasal's specialty is barbecued chicken. What I like with Mang Inasal is its distinctively Filipino ambiance. 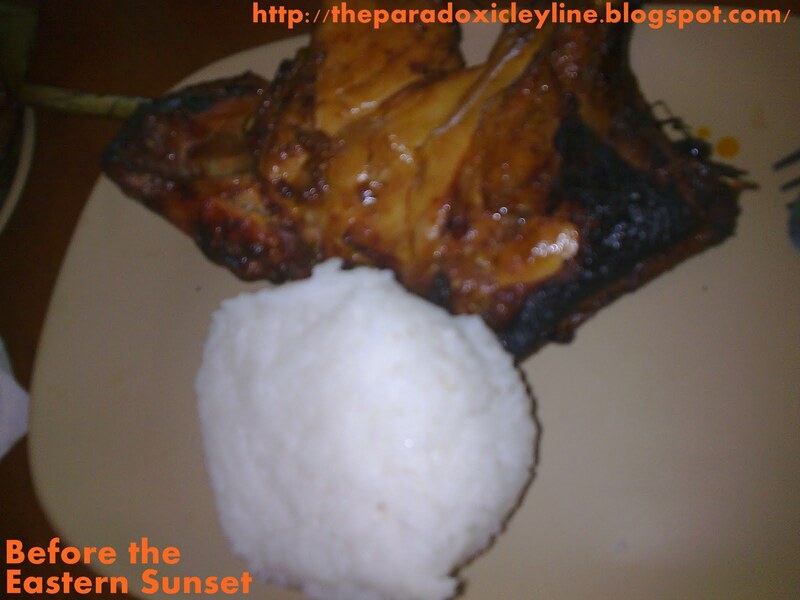 Anyone can eat chicken barbecue the traditional way inside Mang Inasal stores. The traditional way that I am saying is that of using bare hands to eat chicken barbecue. We always eat this way in Mang Inasal. It is quite different when we are in other restaurants like KFC or Kenny Roger's Roasters where it is not “cool” to use bare hands while eating their chicken. Mang Inasal also uses native herbs and spices and wraps their food on banana leaves, giving the restaurant that distinct Pinoy mark. 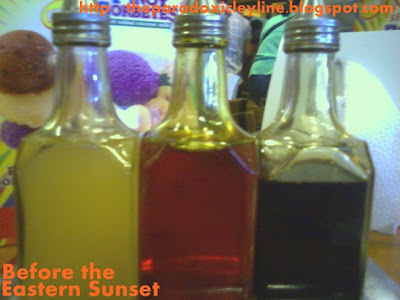 The usual Pinoy sawsawan: vinegar, chicken oil and soy sauce. Me and my beloved keep on coming back to Mang Inasal to eat their Paborito Meals (Favorite Meals). Paborito Meals are Mang Inasal meals that have unlimited rice promo. For less than 100 Pesos, we can eat chicken barbecue plus all the rice that we can eat, which is usually three to five cups of rice. Mang Inasal's Paborito Meal is truly affordable especially if we are suoer-hungry. Aside from unlimited rice, customers are also entitled to unlimited sabaw. Just add a certain amount and customers can also enjoy unlimited refill of iced tea. Mang Inasal Paborito Meal - paa ng manok or is this pecho? We usually order the barbecued chicken leg and barbecued pecho. Mang Inasal's chicken barbecue is quite good and the chicken is not dry. This is better than the inasal that I ate in another restaurant, located somewhere along Katipunan Avenue, that is very dry that it almost made me choke. Mang Inasal chicken barbecue is not like that. My complaint with chicken barbecue from Mang Inasal is that they are usually charred. I am not sure if that is way inasal is cooked but I believe that Mang Inasal's chicken barbecue will be better if it is not charred. The possible reason for the char is that the cooking of the chicken barbecue is rushed. They rush is needed to quickly give the orders of customers that are already lining outside the restaurant. There is a study that charred meat is carcinogenic, that's why I avoid eating the burnt part of the chicken barbecue. I hope that Mang Inasal improve their chicken inasal so that their customer will enjoy their specialty. They should find a way where they can still barbecue the chicken quickly but the quality is not compromised. Visit Ahab Reviews and Tips and read about the posture correction cushion. paborito ko talaga yang Mang Inasal..nkakagutom. Ako nga rin nagutom sa post na ito eh. He he he. Mahilig ka rin pala sa chicken inasal ng Mang Inasal. Yup, ok na ok sa akin yung pagkain nang naka-kamay. Isa ring bentahe iyan ng Mang Inasal eh. Hirap kaya kumain ng roasted chicken ng spoon and fork ang gamit. Favorite food ni Ykaie ang Mang inasal! Lagi nagpapabili. hehehe! Ako nagkakamay din pag kumain jan. feel na feel ko nga e. lol! Yan din napansin ko sa mang inasal sunog ang balat. YUn pa namn ang fave part ng pamangkin ko. The rice is just white rice or is there any special thing with it? Cos I normally dont eat a lot of white rice, so the unlimited rice does not seem to attract me haha! Oh yes, I always avoid eating the charred parts - they are indeed carcinogenic and cancer causing so if the chicken at Mang Inasal is badly charred, I think not such a good idea to eat there often! Ay naku. Yung balat din ang favorite ko eh. Hay sana maayos na ng Mang Insal yung pag-ihaw ng mga inasal nila. Thank you for the tip Foong. So this means that Mang Inasal need to offer free cucumber together with their charred chicken. minsan na akong nakakakain sa mang inasal..
Aching to eat the best tasting chicken inasal? You should be at LAI GARDEN MIXED FLAVORS AND TREATS at Gaisano Capital South in Cebu City.....there you will savour the greatest chicken inasal in the philippines if not in asia!!! super yummy!!! p99 unlimited rice with pancit canton and dessert...talagang super sulit!!!! Thanks for the info. Hopefully ay matikman ko ito when I return to Cebu.